The suspense was brilliant. First the concept of metal skin welded to human brain was mentioned. Then we saw metallic feet marching, but no more. 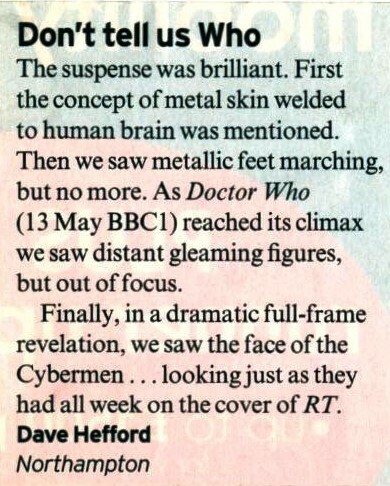 As Doctor Who (13 May BBC1) reached its climax we saw distant gleaming figures, but out of focus. Finally, in a dramatic full-frame revelation, we saw the face of the Cybermen ... looking just as they had all week on the cover of RT. APA 6th ed. : (2006-05-27). Don't tell us Who. Radio Times p. 144. MLA 7th ed. : "Don't tell us Who." Radio Times [add city] 2006-05-27, 144. Print. Turabian: "Don't tell us Who." Radio Times, 2006-05-27, section, 144 edition. This page was last modified on 10 February 2016, at 23:52.